MacBook Air 11" 2011 2012 2013 2014 A1465 A1406 A1495 Replacement Battery 5200mAh 39.5Wh by Max Capacity """
Our internal MacBook Air 11" 2011-2014 A1495 A1465 A1406 Replacement Battery 5200mAh 39.5Wh by Max Capacity combines both the power and reliability you expect from a very good replacement battery. 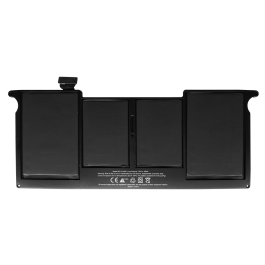 Our 2011-2014 MacBook Air A1406 A1495 replacement battery provides great power and a long service life. Rated at 5200mAh 39.5Wh, this is one of the most powerful and long lasting replacements that is true to the original in every way! *** 3 year average service life which is double the service life of other replacement batteries. *** Built with a high quality li-poly cell that matches Apples original designs and dimensions . Max Capacity is committed to producing high-end, high performance laptop replacement batteries and adapters. We continually look battery enhancements with the goal of producing the most advanced, safe and powerful li-polymer batteries available. Your laptop will run longer when using our batteries. Our batteries are lighter in weight and maintain some of the highest energy capacity over the life of the product. More energy capacity equals longer run-times between charges.